Put your confidence in a service in New Cross with a client rating of over 96%! Q: What does the window cleaning in New Cross include? Q: Who will clean my window façade? A: Our service will be conducted by experienced and police-checked New Cross window cleaners. They'll also be dressed in branded uniforms, so you'll easily notice them as soon as they approach your property. A: Basically, this is a telescopic rod that blasts water under strong water pressure. It allows the experts to reach the fourth floor of any business or residential building without lifting their feet off the ground. A: Not at all! The experts will make use of a special purified water storage inside their van. However, if the tank is empty, we will gladly take your offer. A: You have to make sure that there will be a empty parking spot within 30 metres from your premises and on the same side of your panes. The experts also need to have an effortless access to your property. When you hire a window cleaning New Cross session, you'll be able to refresh the panes of any premises at reasonable fees that remain changed by minimum contracts or concealed payments. See if you agree with our opinion – have a glimpse at our user-friendly price table below. According to your needs, our window cleaning New Cross can provide you with three options. 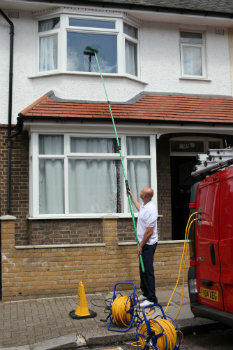 If you choose exterior cleaning, the technicians will deploy a special water-fed rod. This gear can expand up to 22 metres in length, which is comparable to the height of a four-storey premises. The New Cross window cleaners will use distilled water under high pressure that will rinse away all grime in little to no time. If you have a high-rise property instead, then go for our rope access window cleaning. There, a team of licensed abseilers will painstakingly clean your windows until they witness the image of the setting sun. For your ease of mind, we maintain the washing equipment on a day-to-day basis and can provide COSHH reports at your request. For internal washing, the adepts will carry ladders and sponges to ensure that even the highest places will get proper treatment. As our customer base expanded, we introduced our window cleaning in New Cross to include other London areas as well. Please consult with our concise list to see which adjacent locations we cover. Alternatively, get a free instant quote or order affordable window cleaning services New Cross SE14 online, through our web site.